Jairamdas & Sons is the authorised stockists for NBC and NTN Bearings. We offer Ball, Angular Contact ball, Roller, and Thrust Bearings. 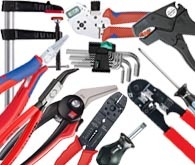 We are the Authorised distributors of Hand tools and Power tools from different companies. We provide standard tools to meet industry's needs. Tailor made Tool Kits are developed on specific demand. Every year, we add new products to our range. Jairamdas & Sons is the flagship company of the Group, represents several global leaders in ferrous and non ferrous metals as their sole sales and service. Copyright© 2009 All Rights Are Reserved.